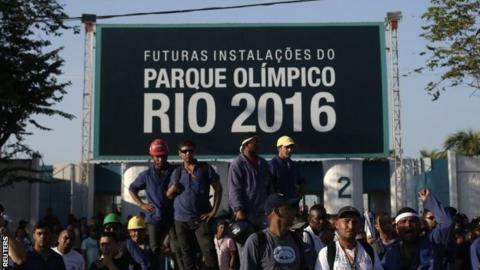 Preparations for the 2016 Rio Olympics are the "worst" ever seen, according to International Olympic Committee vice-president John Coates. The Australian said the IOC has taken "unprecedented" action by placing experts in the local organising committee to ensure the Games go ahead. "The situation is critical on the ground," he said. The news comes as Brazil faces a race to be ready in time for the Fifa World Cup, which starts in 44 days. Coates, who has been involved in the Olympics for nearly 40 years, has made six trips to Rio as part of the commission responsible for overseeing the preparations. He added that one of the experts embedded in the local committee was a construction project manager. "The IOC has adopted a more hands-on role," said Coates. "It is unprecedented for the IOC but there is no Plan B. We are going to Rio." He said that, in his opinion, this was "a worse situation" than in 2004, when there were concerns about preparations for the Athens Games. "It's the worst that I've experienced," he added. "We have become very concerned. They are not ready in many, many ways. We have to make it happen and that is the IOC approach. You can't walk away from this." Preparations for the 2004 Athens Games were marred by delays in construction and service delivery, but the venues and infrastructure was ultimately delivered in time. Coates said that construction has not even started on some venues in Rio, which will host South America's first Olympics, while infrastructure is significantly delayed and the city has "social issues that need to be addressed". He added that Rio organisers have the same number of staff - 600 - as London did at the same stage in their preparations for 2012, but did not have the necessary experience. Coates, who was involved in the organisation of the Sydney 2000 Games as head of the Australian Olympic Committee. said it was proving difficult for the IOC to get the answers they needed. Coates also claimed that only two people were working in Rio's test event department with tournaments scheduled to start this year.